Neat and cozy terraces house with community pool. For 4-6 persons. On the ground floor there are a spacious lounge and dining area, a completely fitted american kitchen, a shower bath room, covered and uncovered terraces and a calm and private patio. Upstairs there are 2 bedrooms, another bath room and a small terrace. Furhter, there is a pull-out sofa bed in the living room. The bungalow is completely furnished and equipped with air conditioning, wifi internet, Sat-TV, microwave, toaster, washing machine, etc. The fenced community pool is just around the corner. 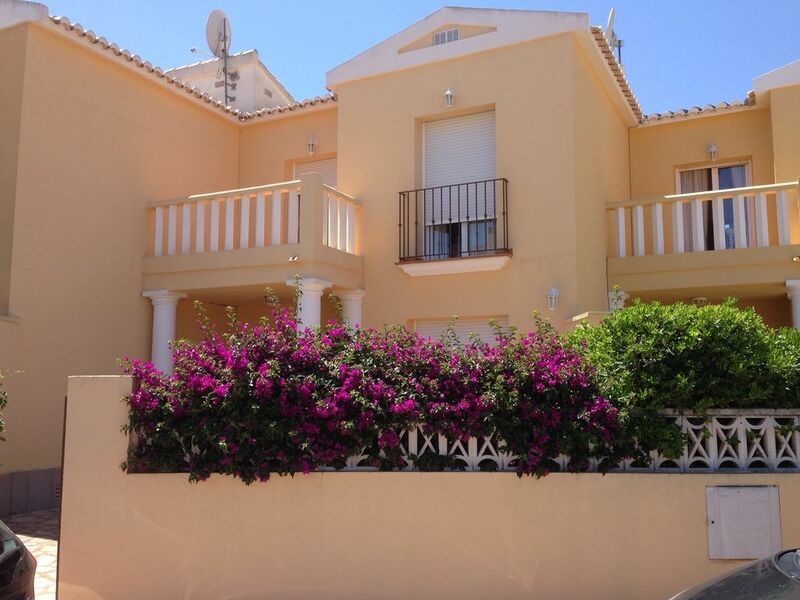 Calm location, not far from shops and restaurants (200 m) and the village centre. The beaches are at 1.500 m, 5 minutes by car or 20 minutes walking. The city of Denia is at 10 km and the large shopping centre El Portal de la Marina in Ondara at only 4,5 km. 2 renowned golf courses (Oliva Nova and La Sella Golf) are at only 9 resp. 14 km from the bungalow. Limpieza final 75€. Toallas/sábanas 12€/persona y estancia. Electricidad 85 kWh. Cuna 20€/semana. Trona 20€/semana. Suplemento adicional para llegadas fuera de horario de oficina. Cargos extras para alquileres a largo plazo (a partir de 28 días). Ménage finale 75€. Draps/serviettes 12€/personne et période. Electricité 85 kWh. Lit bébé 20€/semaine. Chaise haute 20€/semaine. Supplément pour les arrivées en dehors des heures de bureau. Frais supplémentaires pour les location de longue durée, à partir de 28 jours. Endreinigung 75€. Handtücher/Bettwäsche 12€/Person und Aufenthalt. Stromverbrauch 85 kWh. Baby Bett 20€/Woche. Hochstuhl 20€/Woche. Zuschlag für Check-in ausserhalb der Bürozeiten. Zusätzliche Gebühren für Langzeitmiete. Final cleaning 75€. Bed clothes/towels 12€/person and stay. Electricity consumption 85 kWh. Baby cot 20€/week. High chair 20€/week. Additional supplement for arrivals outside of office hours. Extra charges for long term rentals, from 28 days.